Sometimes, in the course of your professional life, you meet someone who has an impact long beyond that initial connection. I met Jerry Burns over 20 years ago. Since then, we have collaborated on projects for everything from Fortune 50’s to Non-Profits down to the smallest of boutique companies. He comes to work every day with a get it done attitude, coupled with a fierce commitment to creating beautiful images that resonate. 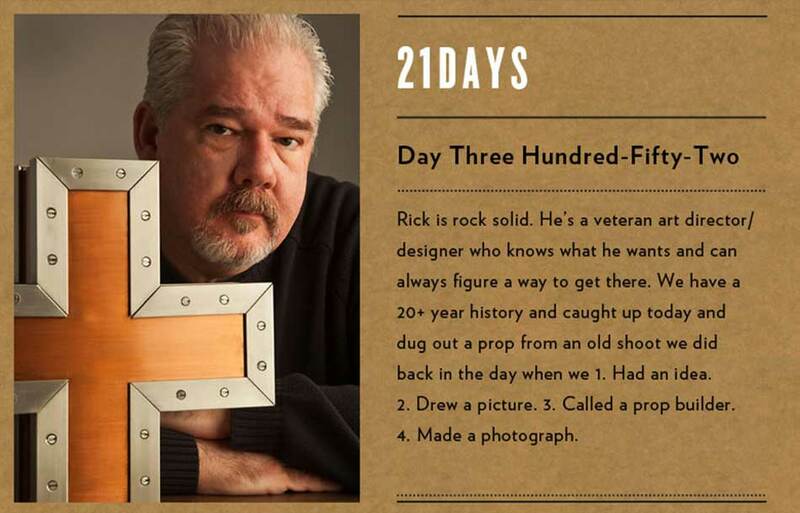 So, I was honored when he asked me to participate in his 21DAYS project. Beginning on Jan. 1st, 2012, he committed himself to shooting a portrait every day. On Dec. 31st he will finish with 365 portraits on the books. The project was designed as a test, a labour of love and a measure of one’s perseverance. You will see an amazing array of people from all walks of life. It’s a testament to one man’s determination to keep the work ethic wheels turning and the creative fires burning. Thanks for the inspiration Jerry. Enjoy the full 21DAYS project archive HERE.